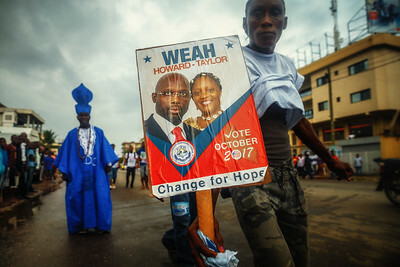 October 2017, Liberians hold their breathe and await the outcome of the first transition of power since the 2005 elections when Ellen Johnson Sirleaf won marking the end of political transition since the civil war ended in 2003. 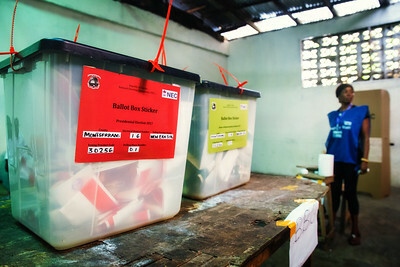 Upon invitation, The Carter Center served as international observers for the 2017 election. 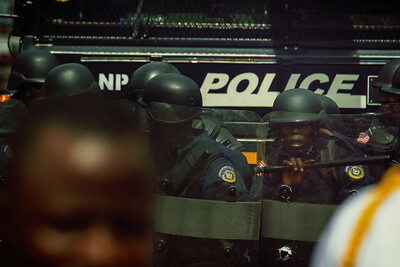 The Carter Center also has many other programs in Liberia with a keen focus on access to information. 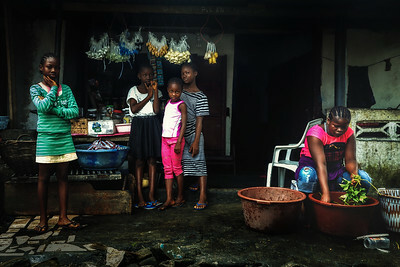 Monrovia, Liberia October 6, 2017 - Girls standing in front of a neighborhood store. 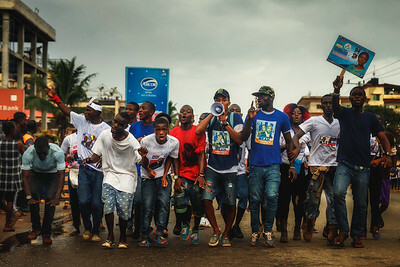 Monrovia, Liberia October 6, 2017 - Street scene with voters walking in support of their candidate before the 2017 election. 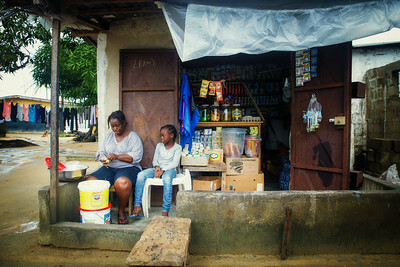 Monrovia, Liberia October 6, 2017 - Jacqueline Clinton, a student in the REVSLA program who owns her own general store, sits with her daughter Moseline. 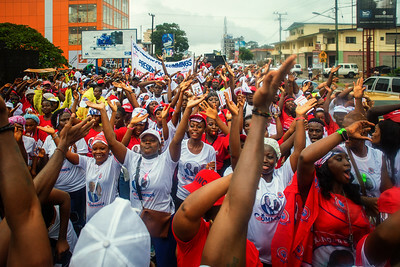 Monrovia, Liberia October 6, 2017 - Supporters parade through the streets in the days leading up to the election. 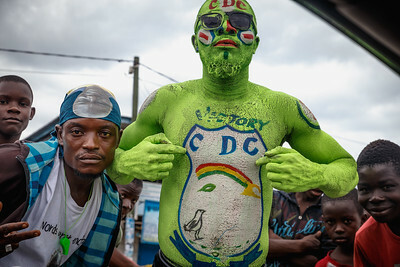 Monrovia, Liberia October 7, 2017 - Supporters parade through rain soaked streets prior to the 2017 election. 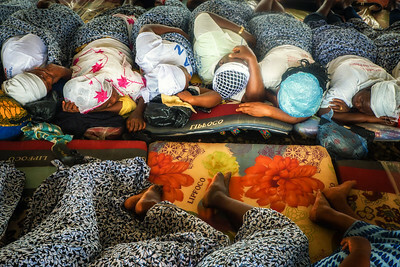 Monrovia, Liberia October 7, 2017 - Women staying at the prayer tent prior to the 2017 election. 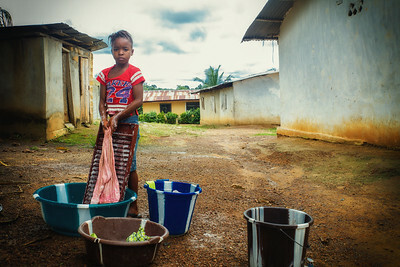 Monrovia, Liberia October 8, 2017 - A young girl washes clothes. 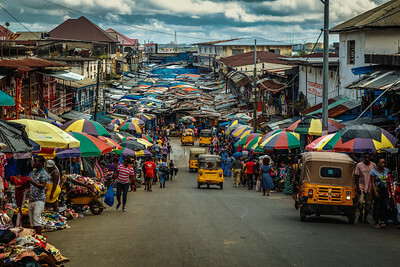 Monrovia, Liberia October 13, 2017 - Sreet scene. 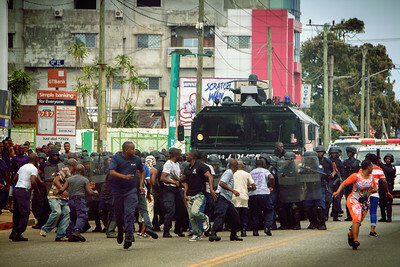 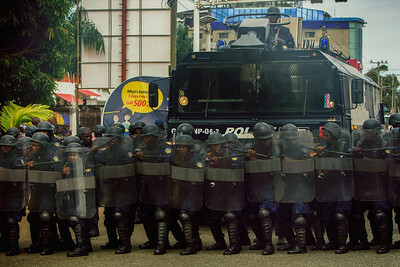 Monrovia Liberia October 9, 2017 - Police rehearse crowd control measures prior to the 2017 presidential election. 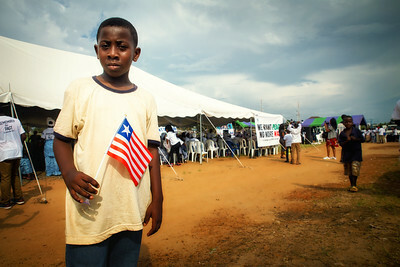 Monrovia, Liberia October 9, 2017 - A young boy holds a Liberian flag outside of the women's prayer tent. 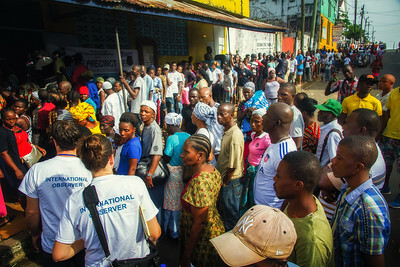 Monrovia, Liberia October 10, 2017 - Voters standing in line on election day. 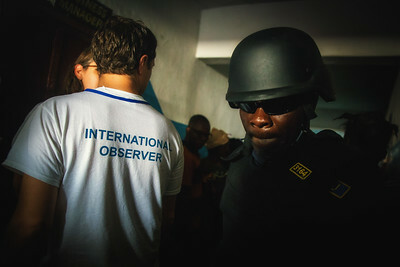 Monrovia, Liberia October 10, 2017 - Carter Center observers arrive at a polling station on election day. 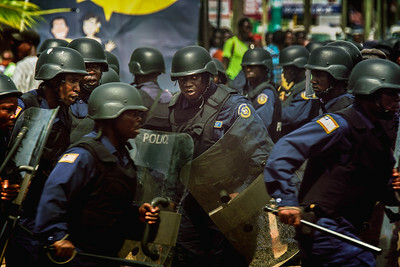 Monrovia, Liberia October 10, 2017 - Liberian police make their way through a hallway at a polling station on election day. 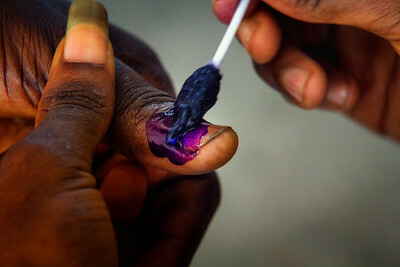 Monrovia Liberia October 10, 2017 - A finger is marked with ink on election day. 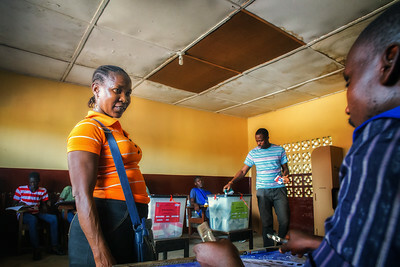 Monrovia, Liberia October 10, 2017 - Ballot boxes on election day. 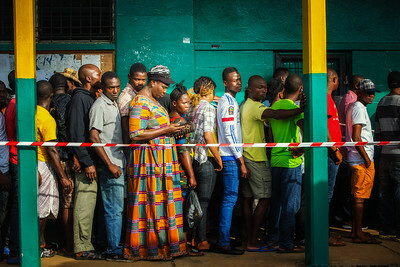 Monrovia, Liberia October 10, 2017 - A polling station on election day. 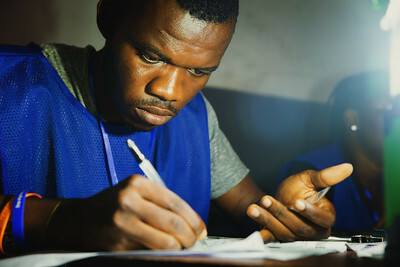 Monrovia, Liberia October 10, 2017 - A polling station worker checks a voter's identification card on election day. 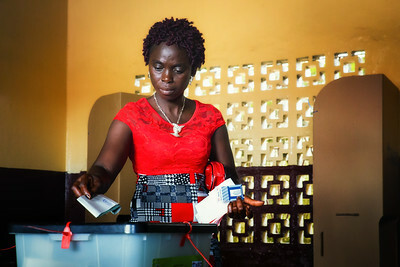 Monrovia, Liberia October 10, 2017 - A woman votes at a polling station on election day. 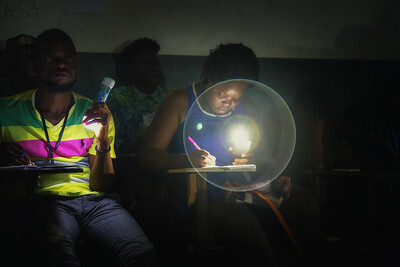 Monrovia, Liberia October 10, 2017 - Polling station obsevers working past sunset on election day. 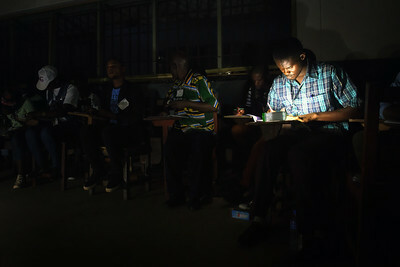 Monrovia, Liberia October 10, 2017 - Election observers working after sunset on election day. 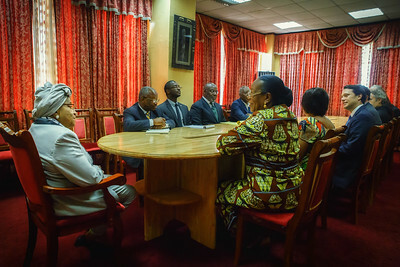 Monrovia, Liberia October 12, 2017 - Madame Samba-Panza and TCC leadership meet with Liberian president Ellen Johnson Sirleaf.